50 neliön huoneisto toisessa kerroksessa vuosikerta rakennuksessa. Exclusive huoneisto sydämessä historiallisessa keskustassa Trapani. Hänen neljä parvekkeet jalankulkualueelta yksi kaupungin tyylikkäimmistä. Se koostuu suuri olohuone, jossa vuodesohva, yhden hengen huone, makuuhuone, keittiö ja kylpyhuone. Erityinen sijainti huoneisto tekee siitä ihanteellinen paikka niille, jotka haluavat kävellä. Muutaman askeleen päässä ovat rannat pohjoiseen, portti lautat saarille, historiallisia rakennuksia, muistomerkkejä, parhaita ravintoloita, kahviloita ja kauppoja yksinoikeudella. Sfeervol, uniek appartement. Wij hadden een optreden van een militair orkest onder ons raam. Heel Trapani komt hier voorbij, je zit er midden in. De nacht kan wat rumoerig zijn, daardoor, maar dat mag de pret niet drukken. De boottocht naar Favignano en daar fietsen is een absolute aanrader. Ringrazio la famiglia Corso per la gentilezza e per la cordialità con la quale siamo stati accolti. L'appartamento è stupendo, ordinatissimo e pulitissimo. E' ubicato nell'angolo più bello del centro. Facilissimo da raggiungere e comodissimo per il posteggio. Grazie ancora!!! We enjoyed our stay at this apartment. It is conveniently located for walking to restaurants, the harbor and other points of interest in Trapani’s port district. Giovanni, our host, promptly responded to all our needs, assisted with transportation to the airport upon our departure and was knowledgeable in answering questions we had about different locations in the city when we checked in. The apartment was clean and well stocked including a washing machine. The apartment is in a building with adequate security. There is an open air market a few blocks away open daily where your can purchase cheese, meat, fresh fish and vegetables. We took advantage of the opportunity to cook some of our own meals. There are also grocery stores within walking distance as well as banks, pharmacies and ATM’s. We enjoyed sitting on the balconies and watching folks out on their evening walks. 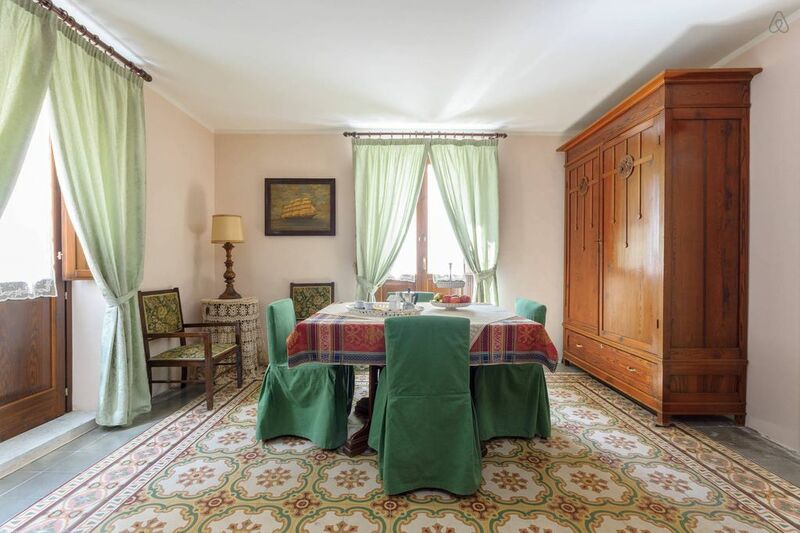 This attractive small flat is right in the tourist centre of Trapani, which means that there aren't many food shops nearby, but then there's only a microwave, so you won't be doing much serious cooking. It was surprisingly quiet: even the clock tower stopped chiming at 8pm. Like nearly all flats and hotels in Italy, it has inadequate lighting, especially for older people whose eyesight is less than perfect. Giovanni, the owner, was exceptionally welcoming and helpful, even carrying our heavy luggage up the rather narrow staircase. We recommend this flat to anyone who wants to be in the centre of things in Trapani. Trapanin historiallisessa keskustassa on ihanteellinen tukikohta aktiiviseen lomailuun. Täältä voit järjestää päivittäin eri retkellä. Alueella on erittäin helppo vuokrata polkupyörän, auton tai skootterin. Olemme myös bussipysäkkejä, taksit ja lentokenttäkuljetukset, jota varten se on erittäin helppo päästä päänähtävyyksistä maakunnan kuten Erice, San Vito Lo Capo, Segesta, Mozia (Mothia) ja kaunis Egadisaarille.